There’s no stopping Jamie Oliver. The guy’s an inspiration. We love the enthusiasm he chucks into sharing his knowledge and experience. 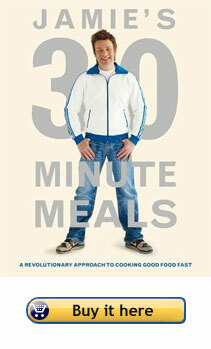 In his new book, Jamie’s 30-Minute Meals, he’s at it again. He shows you that by mastering a few kitchen tricks and being organized and focused, it’s not only absolutely possible, but also dead simple, to get a complete meal on the table in the time you’d normally spend cooking up just one dish. The book contains 50 brand-new meal ideas, and as you’d expect from Jamie they’re all exciting, varied and seasonal. You’ll be amazed at what you’ll be able to achieve in half an hour – complete meals with main courses, side dishes as well as puddings and drinks; they’re all meals that you’ll feel well chuffed with when you serve them up to your family and friends. And, typically Jamie, they all include a salad or vegetable dish, so they’re balanced and healthy, too. The recipes are written in a way that’ll help you make the most of every single minute in the kitchen. This book’s practical, with lots of step-by-step pictures, inspires confidence, and shows that with a bit of preparation, the right equipment and some organization, delicious, hearty, quick meals are only half an hour away. But, hey, why not let Jamie explain it to you?